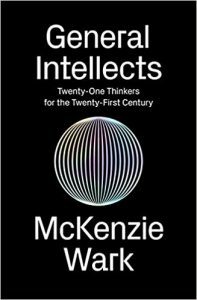 McKenzie Wark’s General Intellects offers critical readings of twenty-one contemporary scholars, including Amy Wendling, Kojin Karatani, Paolo Virno, Yann Moulier Boutang, Maurizio Lazzarato, Franco ‘Bifo’ Berardi, Angela McRobbie, Paul Gilroy, Slavoj Žižek, Jodi Dean, Chantal Mouffe, Wendy Brown, Judith Butler, Hiroki Azuma, Paul B. Préciado, Wendy Chun, Alexander Galloway, Timothy Morton, Quentin Meillassoux, Isabelle Stengers, and Donna Haraway. Although it may appear to be an introductory text, General Intellects is not for those wholly unfamiliar with these figures. Wark’s studies are idiosyncratic and in some instances brazenly unorthodox. However, they have much to offer to those curious about the social and political contexts of their subjects. Wark draws from expertise in nineteenth and twentieth-century scholarly movements to situate, historicize and critique the selected cohort, rendering them a worthy supplement for readers with some prior exposure. General Intellects’ most significant contribution, however, is not to be found in its bespoke commentaries, but rather in Wark’s striking and original argument on knowledge production, a perspective which informs each individual review. This may be paraphrased as follows: the potential of contemporary intellectual labor will only be realized to the extent that thinkers make their work available to the ‘general intellect,’ a figure established as the obverse of the better-known ‘public intellectual’ exemplified by the likes of Simone de Beauvoir, Jean-Paul Sartre and James Baldwin. The ‘public intellectual’ is portrayed as a myth based on a critical misconception of how knowledge is actually made and disseminated. Knowledge is more accurately construed as the outcome of communal efforts. Wark writes that after Marx, intellectual labor `could only be a collaborative practice of knowledge among different but equal ways of knowing’ (7). Accordingly, Wark censures the development of scholarship that authorizes individuals or academic fields to the exclusion of others. Such gatekeeping only supports a destructive program of intellectual proprietorship. Wark writes that total authority remains a common goal, even among seemingly radical thinkers. Each of the twenty-one is said to see `the world from the point of view of a certain way of working, and [generalize] that way of working into a whole worldview,’ (14) an ambition that leads them to ‘spend too much energy trying to maintain the sovereignty of their own point of view over all others’ (14). Wark advises that to move beyond capital’s intellectual silos, general intellects must blend contributions from a variety of individuals and disciplines, with no one taking precedence. They should also cultivate a certain humility. Their task is not to establish themselves among an élite class who style themselves as the authors of history, but to develop a chimeric common language that embraces its own evolution. The author is entirely invested in this project, noting salient affinities and resonances among General Intellects’ twenty-one thinkers. These points of intersection are deemed most productive toward the development of a general, if not total, grasp of global situations. Wark is notably concerned with the anthropocene, but no object of inquiry falls beyond this schema. This approach may be adopted by scholars similarly committed to building a shared language: General Intellects functions well as a methodological handbook. The chapters follow no particular organization, cross-referencing and riffing on one another freely. Each invokes scholars and ideas beyond the scope of their nominal subject, and some include personal anecdotes from Wark’s own colorful career. Although the chapters can be read in any order, it is advisable to start with the Introduction. Here, readers will find a description of the main argument and its historical influences. Chief among these is an excerpt from Karl Marx’s Grundrisse famously known as the ‘Fragment on Machines,’ where Marx (2014) first conceptualized the ‘general intellect.’ The term originally described a ‘social brain’ or collective intelligence that rises as a sort of gestalt layer above discrete and individual acts of knowledge production (7). For Marx, the general intellect was a constituent of political economy. For Wark, it is a symptom indicative of an under-theorized cause – a cause whose deduction is ever more urgent following the digital turn and subsequent rise in intellectual labor. ‘The social brain becomes part of capital,’ Wark writes, ‘but who or what actually makes the social brain?’ (8). To some extent, all members of a society are implicated, but some progress can be made by illuminating less recognized parts of this social brain. Posed as such, the distinction between who or what here turns out to be basically rhetorical. Wark maintains that the actors, materials and means of knowledge production are co-constitutive, although the first – the ‘who’ – has perhaps garnered too much attention (3). Drawing readers toward methods and materiality, Wark’s surveys highlight two less-acknowledged aspects of the general intellect. First is the genesis of new technological modes of production in the twentieth century (3). The second is the marked effect that modern information technology has had on technoscientific enterprise (3). ‘A consequence of the first of these two situations,’ Wark writes, ‘is that I don’t think one can bracket off the question of techne from questions about the social, the historical, the political and the cultural and so on’ (4). ‘A consequence of the second situation is that one can no longer treat social phenomena as if there was a stable background of natural phenomena that can be bracketed off and ignored’ (4). These forces constitute the book’s major axes of evaluation. Many of its critiques are premised on the extent to which a thinker engages the material component of techne and affirms an integrated vision of the social and the natural. At times Wark’s commitment to these issues misleads them from the nuances of a particular thinker. This is certainly the case in the chapters on sociologist Maurizio Lazzarato and philosopher Timothy Morton. Wark reviews Lazzarato’s Signs and Machines: Capitalism and the Production of Subjectivity (2014), in which the legacy of philosopher Felix Guattari is extended to assert a ‘contemporary crisis of subjectivity’ (77). Although Wark appreciates Lazzarato’s ‘move towards understanding subjectivity as something produced by machinic operations’ this approach is ‘not an effective way of addressing the centrality of information, or the way particular historical arrangements of the machinic make information a control layer over both objects and subjects’ (92). Morton (2013) commits similar errors in his Hyperobjects: Philosophy and Ecology After The End of The World, in which he contemplates ‘the gap between essence and appearance itself.’ Wark lambasts Morton’s remark that ‘“a thing just is a rift between what it is and how it appears.”’ For Wark, things only ‘just are’ ‘once we have erased the inhuman praxis that produced it as an object of contemplation in the first place’ (274). Morton’s philosophy apparently fails by excluding the tangible precursors to received scientific wisdom (274). It is true that many of today’s thinkers insufficiently grasp both technology as materiality and technoscience as the outcome of labor. But for thinkers who do not examine information technology per se, this charge forecloses more pertinent critiques. Meanwhile, contemporary scholarship in the domain of information technology is not as naïve to materiality as Wark’s insistence would have it. Morton and Lazzarato are noted as leaning too heavily on metaphors (270, 85). Metaphors are a major vexation for Wark: Guattari’s work appears to be responsible for Lazzarato’s figurative treatment of machinery. Meanwhile, political theorist Wendy Brown (2015) is said to treat capitalism all too interpretively in her book, Undoing The Demos: Neoliberalism’s Stealth Revolution (85). If the metaphor problem is as pervasive as Wark declares, it would seem to imply something a bit deeper than a perfunctory offloading of intellectual work onto semantics. A number of scholars in discourses with which Wark is familiar – including the Italian workerist tradition and the empirically-informed media theory of Wendy Chun and Alexander Galloway – have written on technology’s tendency to degrade boundaries between metaphor and direct denotation, or the immaterial and material. This line of argumentation follows from Chun and Galloway’s writings, although Wark does not mention this in their respective chapters. It has also been developed extensively by philosopher Eugene Thacker, with whom Wark and Galloway (2013) collaborated on the book Excommunication: Three Inquiries in Media and Mediation. These are evident omissions from Wark’s survey, and they force one to wonder whether Wark sometimes cherry-picks scholars and arguments for their availability to the single criterion of material engagement. The strongest reviews are on thinkers sympathetic to the application of Marxist thought to Wark’s typification of knowledge processes, including Donna Haraway, Isabelle Stengers and Amy Wendling. Thinkers who seem too comfortable within its parameters, including philosopher Slavoj Žižek, are excoriated. For Wark, this is a signature error of the humanities, among which philosophy has too often been considered the ‘ruling party’ (4). There are many good reasons to disagree with Žižek, but this contestation – which is based on Žižek’s commitment to abstractions of negativity – is decidedly oblique. It appears shoehorned into Wark’s anti-elitist framework. General Intellects’ focus on single publications is another weak point. In several cases, Wark selects one text from a scholar’s canon and extrapolates liberally from there. This may well deceive readers for whom General Intellects is an entrée into a modern academic landscape. As it is, Wark is skeptical of books, asking ‘how can we even write books in the era of Snapchat and Twitter? … books are a problem for the era of communicative capitalism, which resists recombination into longer threads of argument’ (145). It is possible that the author takes so much interpretive freedom so as to facilitate recombination into other forms. This appears to be a respectable tactic for wily thinkers: propriety is not a concern. In some sense, General Intellects might be read as a subversion not only of the public intellectual, but of the book as epistemic form. The author’s queer approach to informational organization would seem to support this. In the chapter on political theorist Franco ‘Bifo’ Berardi, Wark offers that our era ‘is post-political to the extent that it is no longer possible to consciously and mythically organize information around a shared project’ (102). But one shared project remains within the realm of possibility: that of informational reorganization. Wark admires philosopher Amy Wendling’s mobilization of what is termed a ‘Marx-field’ (Wark’s phrase, not Wendling’s) (15), which is ‘a matrix of variations on [Marxist] themes, each more or less useful in particular situations.’ The Marx-field stands as a counterpoint to canonized or fiat Marxisms. General Intellects is best understood as part of both a Marx-field and a Wark-field that others are at liberty to reformulate as they wish. Like the Marx-field, the Wark-field could be a stage for multiple revolutions. The one prescribed here would upend old ways of thinking about the reason for intellectualism. Approached uncritically, it casts an existential shadow over the enterprise of scholarship. But if read as part of a Wark-field, it may inspire thinkers to identify as part of the eclectic and uncontainable general intellect, a collective that does not mourn but rather celebrates the end of academic mastery. This group would even make room for its own antagonists: the Žižeks and Mortons of the Wark-field serve as antibodies, sparking healthy opposition within the fold. The question of whether so much inclusion might lead to self-destruction could only be answered in practice. This book will not help readers aiming to understand its subjects on their own terms. In many instances, it challenges dominant interpretations, even those of the most seemingly open-minded scholars. General Intellects is instead a tool for the detection and dismantling of capital’s ever-growing influence on knowledge. Perhaps it is difficult to digest because its implications reach so far: the work to be done is immense. For those who accept the text’s basic premises, however, the burden of vanguardism is a small price for the future of intellectual life.